Reading children’s books about feelings is an effective way to help both young children and teens learn to navigate their emotional world. Feelings books for toddlers, preschoolers, kindergarteners, and older kids can help kids begin to understand their emotions. Knowing how to describe, express, and manage emotions such as anger in healthy ways is important to a child’s social-emotional development and health. Feelings can be confusing when we don’t have the words to express them; they can also be overwhelming and scary when we keep them to ourselves. Knowing how to describe our emotions is important to a child’s social-emotional health and development. So is knowing it’s okay to express and share our feelings with others in healthy ways. As a psychologist and educator, I have discovered many ways to help children (and myself) understand the emotional body and learn to self-regulate. 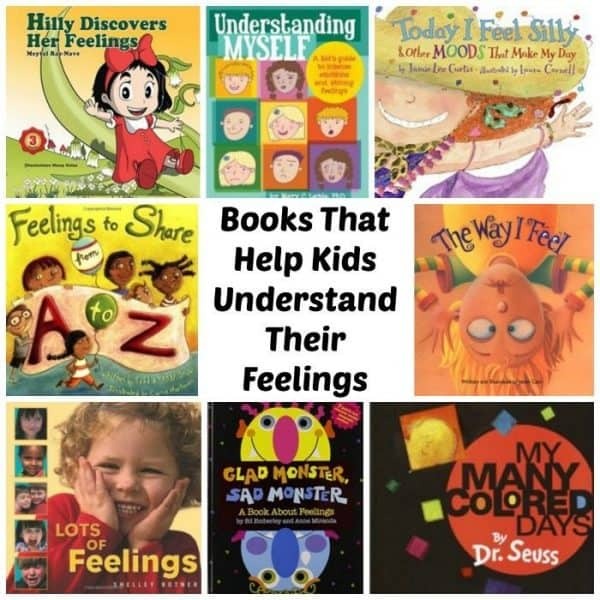 The easiest way to do that is to read children’s books about feelings and emotions. I have witnessed the benefits of reading feelings books to my daughter when she was only a toddler. At 2 she was able to understand basic emotions well enough to label them and communicate them with me. As the days went by I found her basic understanding of feelings and emotions to be more valuable than gold. My husband and I firmly believe that reading books about feelings and anger management has both reduced our daughters temper tantrums and lessened their severity. 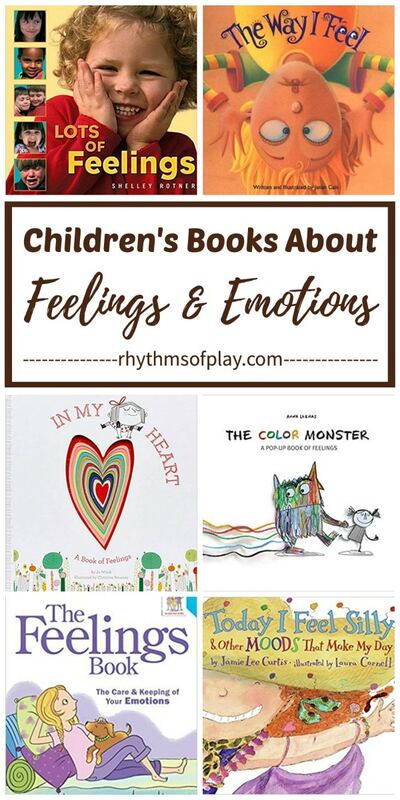 We can’t recommend feelings books for children highly enough… stock your library! The practice of yoga, outside nature play, and social-emotional development games are other simple ways I have found to help children (and adults!) learn to navigate their emotional world. Another one of our favorite calming strategies is the use of calm down sensory bottles. Click the link to learn more about them! Look for these Children’s books about feelings at your local library. If you can’t find them, we have provided Amazon affiliate links for your convenience. If you click the title of the feelings book to purchase, this website will earn a small commission with no cost to you. This feelings board book introduces five essential expressions: happy, sad, angry, surprised, and silly. Each is introduced with a large image of a baby’s face. Readers are asked to mimic the face, then pick it out from a group of other babies. The very last spread includes all of the expressions from the previous pages, and a mirror so readers can watch themselves make any face they please. by Jo Witek (Author), Christine Roussey (Illustrator) (2-4 years) — This book explores a full range of emotions, describing how they feel physically, inside. With language that is lyrical but also direct, toddlers will be able to practice articulating and identifying their own emotions. by Dr. Seuss (2 – 5 years) — This is a color concept book to use with babies or feelings and moods book to discuss with toddlers. by Shelley Rotner (3 and up) — Children can learn to identify the feelings of others by reading this awesome little book. Simple text and photographs introduce basic emotions such as happy, grumpy, thoughtful, etc. by Ed Emberley & Anne Miranda (3 – 5 years) — This is a fun interactive book that kids can use to understand the way they feel. Your child can try on funny masks as they walk through the wide range of moods all little monsters (kids) experience. by Disney Book Group (ages 3 and up) — Get to know Riley’s infamous emotions with this unique format. With five fun storybooks, each devoted to a different Emotion, fans of Pixar’s Inside Out, will treasure this special collection of Joy, Sadness, Fear, Anger, and Disgust. by Baby Professor – Teach your kids about feelings and emotions so they can express themselves well. Children feel many emotions on a daily basis, the ability to name them leads to understanding them. by Todd Snow and Peggy Snow (3 – 5 years) — This book helps children build and use a vocabulary for communicating their emotions. Some of the rhymes and word choices in this book were awkward and didn’t flow very well. I decided to list it here because it contains more feeling words than most books about emotions for children. We found it useful, and recommend it, even with the slight awkwardness. by Baby Professor (Ages 3 and up) – Learning about the senses is an easy way for kids to learn about the body and what feelings mean. Children can begin to understand their emotions and feelings and learn to respond appropriately as a result of reading this book. by Abbie Schiller and Sam Kurtzman-Counter (Ages 3 – 6 years) — Reading this story helps children learn the universal and transitory nature of all emotions. It looks at feelings of all sizes and shapes and helps young children both understand their feelings and know that it is okay to express them. by Anna Llenas (ages 3 – 7 years) — Bright illustrations and amazing 3-D pop-ups illustrate common emotions such as happiness, sadness, anger, fear, and calm. It is both a delightful book to read and a great tool for helping young kids sort out their emotions. by Janan Cain (3 – 8 yrs) — The day my daughter said, “I’m feeling shy” at only 2 years of age I knew that she was learning how to identify her feelings thanks to reading this book. I like the note to parents in the back showing how this book can be used to help children understand what circumstances make them feel happy, sad, jealous, and so on. by Todd Parr (3 and up) — The illustrations in this book are fun, but this book does not teach about emotions as effectively as some of the others in this list. There are a few emotions included (scared, brave, cranky, lonely, and silly), but most of the “feelings” are more about wanting to do certain activities. by Meytal Raz-Nave (3 and up) — Throughout this book, Hilly’s quest is motivated by one simple question, “How do I feel?” in response to different events that she encounters in daily life. While reading this book, children can learn about their own feelings and emotions through Hilly’s varied experiences. by Andi Green (3 and up) — The WorryWoo Monsters stories teach simple lessons about many different feelings and emotions and how to handle them. This is one of several in the series. Links to others by the same author can be found on the same page. by Dr. Lynda Madison (8 and up) — The Feelings Book will help children understand their emotions, and deal with them in positive ways. Inside you’ll find tips on how to express feelings and stay in control, plus get sensitive advice on handling fear, anxiety, jealousy, and grief. by Mary C., Ph.D. Lamia (9 and up) — This book offers a basic education for families in understanding, managing and discussing strong emotions and feelings. The straightforward information also makes it useful for older teens and parents struggling to understand their children’s feelings. by Thomas McIntyre Ph.D. (9 and up) — Many kids and teens have challenges when it comes to behavior. In this revised edition of his time-tested book, you will find practical strategies and sound advice to help kids learn to make smarter choices. These social-emotional development resources for kids will help parents and caregivers understand how to help their children deal with, understand, and express their emotions in healthy ways. The skills I have developed as a result of reading these books have helped me navigate the treacherous waters of helping my spirited daughter understand her emotional world. Todd Parr’s flashcards do a great job of helping kids understand their feelings. These 20 sturdy flashcards with 40 different emotions make understanding feelings fun! Each card shows two opposite feelings, one on each side, rendered in words and lively pictures. Kids will learn what it means to feel silly and serious, calm and nervous, brave and scared, etc. by Daniel J. Siegel & Tina Payne Bryson — This is one of my absolute favorite parenting books. In it the authors explain the new science of how a child’s brain is wired and how it matures. A must read! For more of my favorite parenting books check out 15 Books Every Parent Should Read. by Daniel J. Siegel & Tina Payne Bryson — This workbook allows readers not only to think more deeply about how the ideas fit their own parenting approach but also develop specific and practical ways to implement the concepts. Dozens of clear, practical and age-specific exercises and activities to assist in brain development are provided. by Ph.D. John Gottman & Joan Declaire (Authors), Daniel Goleman (Foreword) — This is a great guide for caregivers to teach children to understand and regulate their emotional world. Emotionally intelligent children enjoy increased self-confidence, greater physical health, better performance in school, and healthier social relationships. by Adele Faber and Elaine Mazlish — A bestselling classic by experts on communication between parents and children. Includes fresh insights and suggestions as well as the author’s time-tested methods to solve common problems and build foundations for lasting relationships. I can’t recommend this book highly enough! Learning how to express emotions is important to a child’s social-emotional health and development. Reading children’s books about feelings is an effective way to help kids and teens learn to manage their emotions. 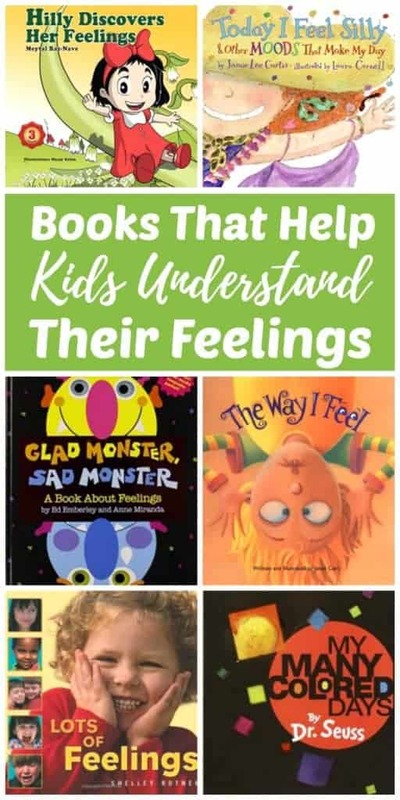 This collection of feelings books for toddlers, preschoolers, kindergarteners, and older children that we have listed above can help kids learn to navigate their emotional world. We have also compiled a list of books to help kids understand and manage their anger. For more information check out this awesome collection of Children’s Books about Anger Management. Reading fairy tales aloud to our children is another way for them to begin to understand how they feel and who they are in the world. Click on the link to learn more. Playing Social-Emotional Development Games for Kids is another easy way to help kids begin to understand their feelings. Click on the link to see an awesome collection of social-emotional games that you can try. The practice of Yoga is another wonderful way to help children learn to calm down and regulate their emotional states. Have a look at Kids Yoga: How to Get Started to learn more. Calm down sensory bottles and getting outside in nature are two more great ways to help children understand their emotions and develop mindfulness. We have a whole slew of outside activities you can try with the kids, and you can find lots of sensory bottle recipes in Calm Down Sensory Bottles 101. These are fantastic books, and a few are our favorites! I love that you suggest going to the library too—that’s totally my go-to move. And it’s nice to see another fan of Whole-Brain Child. Totally changed how I viewed development and tantrums. p.s. I found your site through the EBA forum 🙂 Nice to meet another parenting blogger! Thanks for coming by for a visit from EBA Nina! So glad to meet you as well. The whole brain child is fantastic isn’t it! ?